CYP develops more flexible connection options for Sonos Playbar | What Hi-Fi? A few eyebrows were raised at Sonos's decision to fit only an optical digital input to its new Playbar, limiting connection options for kit with analogue, coaxial or HDMI outputs. Now accessories specialist CYP has come to the rescue with six simple connectors that provide extra flexibility. Phil Davis, CYP sales and marketing director, says: "The new Sonos Playbar only has a single, optical input but not all TVs have this digital sound connection. We also know that many users will want to run extra sources – such as a blu-ray player, Sky+ box or games console – into the soundbar." Coaxial-to-optical converter – for TVs and/or sources with a coaxial output, allowing them to send digital sound to the Playbar’s optical input. Analogue-to-Digital Audio Converter – for TVs and/or sources with traditional, analogue outputs, allowing them to send digital sound to the Playbar’s optical input. 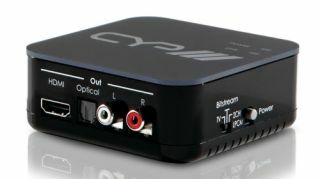 Two-Way Optical Audio Switcher – plug in two sources (eg TV, Sky+ box) with a single, switchable output to the Playbar. Four-Way Optical Audio Switcher – plug in up to four sources (eg TV, Sky+ box, DVD player, games console), with a single output to the Playbar. Switch sources quickly via the included remote control. Two-Way Digital Optical Audio Splitter – handy as the Playbar doesn’t have an optical pass-through. v1.3 HDMI Audio De-Embedder (5.1) with built in repeater – strips the audio out of an HDMI signal to send to the Playbar. Plug your source (eg Blu-ray player, Virgin box etc) into the CYP with an HDMI cable – you can then run sound via optical cable to the Playbar, with a second HDMI cable carrying the picture to your display. Designed for where the TV doesn’t pass through the audio. All six solutions are on sale now, from a range of specialist retailers.